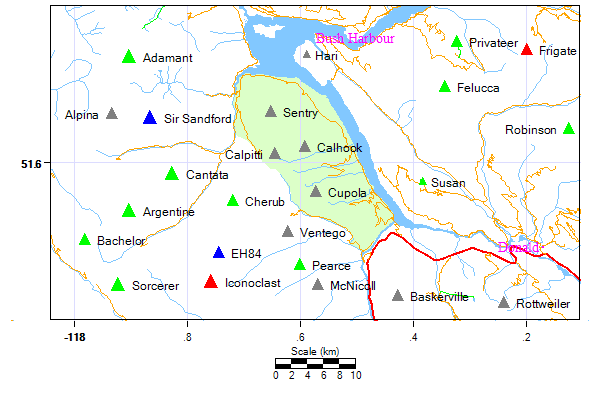 Area: 251 sq km.Location: Located in the Selkirk mountains, just west of the flooded Columbia River Valley, and SE of the Adamant Range. Terrain: Terrain is suitable for ski touring, alpine touring . In winter has an average of 2-3 meters of dry snow. The area has four backcountry lodges accessed via helicopter from Golden. History: The word Esplanade means a long, open level area, usually next to a river, or body of water. A similar word is Promenade. The first usage of the term for this area was in the CAJ article by P.A.Carson, describing where they went in 1908 to reconnoiter Sir Sandford.